There are so many reasons to put down my iPhone but when I am in the company of my children and grandchildren. How do you feel when you are talking to someone and they are not looking at you… not only are they scanning the surroundings but they are eyeing their phone for messages? I feel diminished when this happens but I have to assume some guilt here because I love scanning my surroundings and am addicted to my cellphone. There is a professional term for these addictions…”soft addictions”. There are professionals, who deal with these addictions…so if you cannot deal with these “soft addictions”…help is available! I am particularly concerned with what children are learning and experiencing. Given the fact that they imitate what they see and hear…it is important to model behavior that we want our children to copy. If we want our kids to be empathic they need to learn to look at us when we are talking to them so they can see our facial expressions. This helps them to interpret feelings by what they see on our face. It helps children begin to integrate tone of voice, facial expression and the words coming out of our mouths. I agree with Dr. Smock and am trying very hard to limit my use of electronic devices when around my grandchild and anyone else with whom I am spending time. For me, I needed the reminder that my son is a little sponge, soaking in how the adults around him interact with the world. Children learn by imitating their role models, and if we — as the adults closest to them — show them that electronic devices are what’s most important, this may have a significant impact on their later attention and empathy skills. 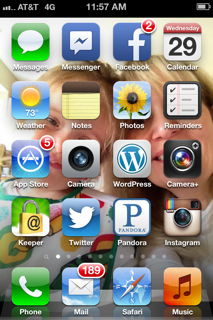 Why I’m Putting Down the iPhone – School of Smock. This entry was posted in Family, Grandmas & Grandpas, Parenting, Styles of Parenting and tagged Dr. Smock, iPhone and kids, screen time by llpitlwp. Bookmark the permalink. Very good, maybe you could write a piece for parenting magazine!!! I collect iPods, iPhones iPads at the door, when the sulking is over, they can be coaxed into the lake, the boat, games………. C’mon parents, take the gadgets away…..while you still can, at least part of each day! Good for you…so important to have time without technology.